Click fraud can be a common and frustrating downside to pay-per-click advertising, but there is no reason to let it deter you from running ads on the Google Ads or Bing Ad platforms. PPC is one of the quickest and most effective ways to generate new business, and when you combine that with many of the excellent third-party click fraud tracking services, you have absolutely nothing to worry about. By using a click fraud prevention service you will be able to quickly eliminate any unwanted clicks that might be coming from competitors, bots, disgruntled customers or any other click-happy individuals. A 3rd party click tracking service like Click Report, for example, will allow you to view the IP addresses that are consistently clicking on your PPC ads. Once you determine which IP addresses are hitting your ads too many times, you can block them directly through your Google Ads account by following the steps outlined below. Sign in to your Google Ads account: ads.google.com. Under the Campaigns tab, click on the campaign you want to exclude from an IP address. If you want to exclude the IP address from every campaign, you will need to repeat this process for each campaign within your account. Click the Settings tab, click on the Advanced settings section, and click the IP exclusions link (see the image below). Click the dropdown arrow next to “Manage IP exclusions” (see the image below). In the text box that opens, enter the IP address that you want to exclude. If you have excluded any IP addresses in the past, they will be visible here. You can have up to 500 blocked IP addresses per ad campaign (see the image below). Click Save to finalize and block the IP addresses that you inserted. 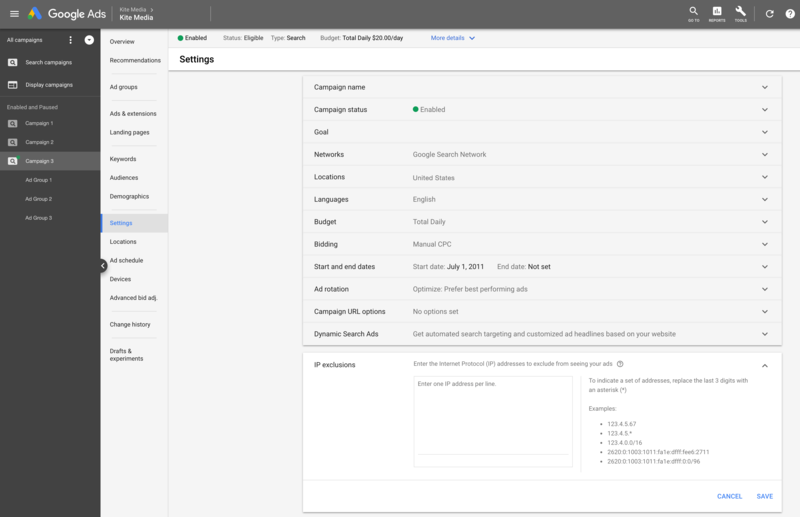 Remember, if you want to block an IP address across all of your ad campaigns you will need to repeat this process for each campaign in your Google Ads account. It’s important to be sure that the IP address you’re blocking is actually responsible for click fraud. Multiple clicks on an ad do not always equate to click fraud. Many of your potential customers will likely read up on your business online and might click on your ad several times throughout the process of deciding whether or not to use your services or buy your products. It’s not uncommon to see 3 or 4 clicks from the same IP address over the course of several days or weeks. Click fraud, however, is typically very easy to catch because you will see multiple clicks from the same IP address within a very short amount of time – 3-4+ clicks within a few minutes or seconds is likely click fraud. Ultimately, you have to decide how many clicks are too many before you decide to block an IP address. I hope this post serves as a helpful how-to for those that are trying to block an IP address in the new Google Ads interface. Visit the Kite Media blog to read up on other helpful Google Ads tips and tricks, and be sure to share this post on Facebook and Twitter!